Part of Mentuhotep III's jubilee scene - he shown both on the left and right sides wearing the Red Crown and the Nemes headdress. Thought to have been in advanced years when he came to the throne (due to Mentuhotep II's long reign), Mentuhotep III's time in power was only to last 12 years. The second son of Mentuhotep II, he inheritated a prosperous country - he consolidated Egypt's borders by building fortresses to prevent any agressive acts by the 'Asiatics'. 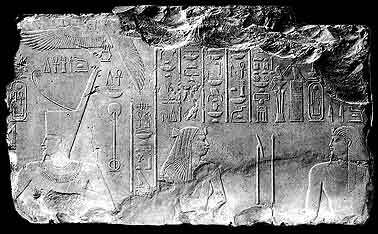 He also continued a heavy building campaign: - Abydos, Elkab, Armant, el-Tod, Elephantine and western Thebes. 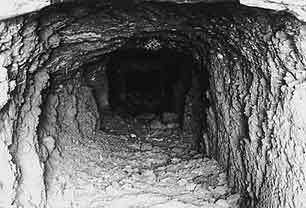 He did begin building his tomb at Deir el Bahri (near his father's tomb), but it was never finished (a causeway stops at a sloping passageway going into the rock) although hieratic graffiti scratched onto the rocks nearby hint that his tomb does exist in the area. And I set out then with an army of 3,000 men, and passed through 'the red hamlet' and through a cultivated country. I had skins and poles prepared to carry the vessels of water, twenty in number. And of the people one carried a load daily .... and another placed the load on him. And I had a reservoir of twelve perches dug in a wood, and two reservoirs at a place called Atahet - one of a perch and twenty cubits, and the other of a perch and thirty cubits. And I made another at Ateb, of ten cubits by ten on each side, to contain water of a cubit in depth. Then I arrived at port Seba (? ), and I had ships of burthen built to bring back products of all kinds. And I offered a great sacrifice of oxen, cows and goats. And when I returned from Seba (?) I had executed the King's command, for I brought him back all kinds of products which I had met with in the ports of the Holy Land. And I came back by the road of Uak and Rohan, and brought with me precious stones for the statues of the temples. But such a thing never happened since there were kings; nor was the like ever done by any blood relations who were sent to these places since the time (of the reign) of the Sun-god Ra. And I acted thus for the king on account of the great favour which he entertained for me".